Arden House Vets: Rabbit awareness Month! We are supporting rabbit awareness week by offering a whole month of free rabbit checks with a vet between Saturday 2nd June - Saturday 30th June. Please call and book an appointment! 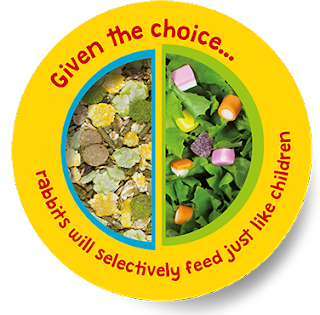 This year's campaign is focusing on 'moving away from muesli' - encouraging rabbit owners to move away from feeding their rabbits muesli style rabbit food and change their rabbits' diets to a healthy hay-based one. Across the UK many rabbits are being fed a muesli-style mix as part of their daily diet. Because rabbit muesli contains a mix of high-sugar flakes and grains, it can encourage selective feeding. This can lead to health problems. So what's the problem with muesli? The different flakes, seeds and grains in muesli make it seem like a balanced food but it encourages rabbits to be picky with what they eat. This is known as selective feeding - where rabbits eat the sugary bits and pieces and leave the less tasty pellets behind. 🐰 Teeth problems - Rabbit's teeth grow all the time. Without proper feeding hay to wear to wear them down, rabbits can develop dental disease. 🐰 Obesity - Selective feeding can increase your rabbit's weight, which can cause all sorts of health problems. 🐰 Tummy trouble - Fibre helps keep a rabbit's gut moving. Not eating enough fibre can lead to serious illnesses like gut stasis and bloat. 🐰 Dirty bottoms - Uneaten caecotrophs ( sticky droppings) can stick to a rabbit's fur, leading to flystrike. If your rabbit has a muesli-based diet, you should slowly change their food to high - quality rabbit nuggets. You should transition their diet slowly over a four week period, as depicted in the visual guide below. Make sure that you don't overfeed with nuggets and increase the overall portion size over this period and make sure your rabbits have access to unlimited high - quality feeding hay. Please call us, we'd be happy to advise you on your rabbits dietary needs. Disclaimer: The contents of the Arden House Animal Hospital website are for informational purposes only. The content is not intended to be treated as a substitute for professional veterinary advice, diagnosis or treatment. Always seek the advice of your veterinary surgeon with any questions you may have regarding your animal's medical condition. Never disregard professional medical advice or delay seeking it because of something you have read on this website.